I am SO excited you guys. Today is the day I fly out to LA for Expo West! YESSS. I have been dreaming of going to Expo West since before I even started blogging. Back during my social media manager days. I envision it has like Disneyland for organic/natural food products filled with every delicious food and beverage I could imagine. This year a handful of my friends in the space are flying out for it too, which makes it even more special. It will be a weekend of hanging with friends, meeting brands in person and hanging with my family since my Mom and Dad are joining me (lolz I am 5 years old, I know). It only seems fitting to share this recipe with you today because it is made with Bob’s Red Mill PALEO baking flour. AKA my newest obsession and addiction. It is a dream come true for a grain-free baker and I have been using it none stop since trying it a few months ago.Bob never seizes to amaze me. AND I get to meet him this week! Every item you could possibly want or need is under the Bob’s Red Mill family. My oats, flours, grains, nuts, seeds, anything! Are all from BRM. And now this paleo baking flour has quickly become a staple in my pantry. Their Paleo Baking Flour Mix is filled with almond flour, arrowroot starch, coconut flour and tapioca flour. It is so flavorful and has an amazing nutritional value compared to your ordinary flour. It has healthy fats, protein and fiber in it making your baking a bit more nutritious the usual. While it isn’t a 1:1 sub for regular flour, it is the ideal mix for making any flatbreads, cookies, brownies, pancakes, etc. into a paleo recipe. I constantly fail at making paleo pancakes and once used a dozen eggs trying to perfect coconut flour ones. I knew that if I could make solid pancakes using this flour, it would be a game changer. 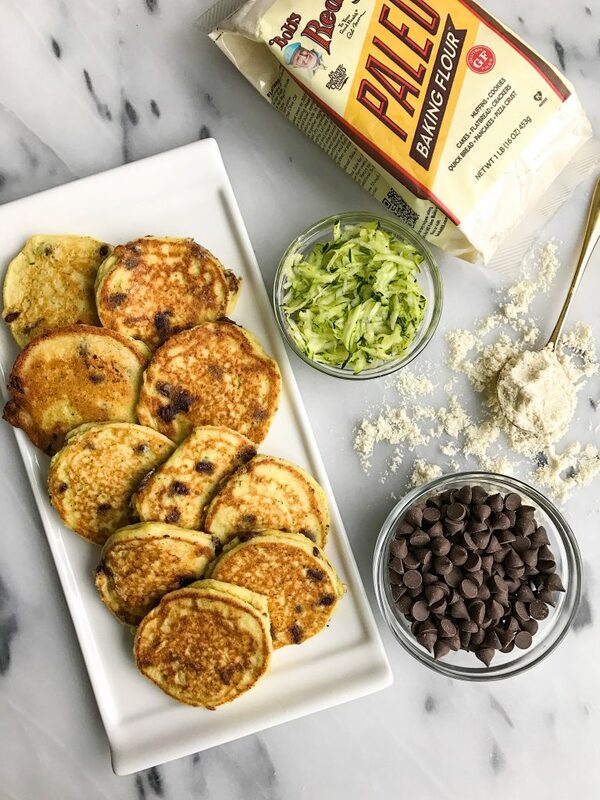 And that is where these Paleo-ish Chocolate Chip Zucchini Bread Pancakes come in. I say “ish” because I do use coconut and almond yogurt while making them. 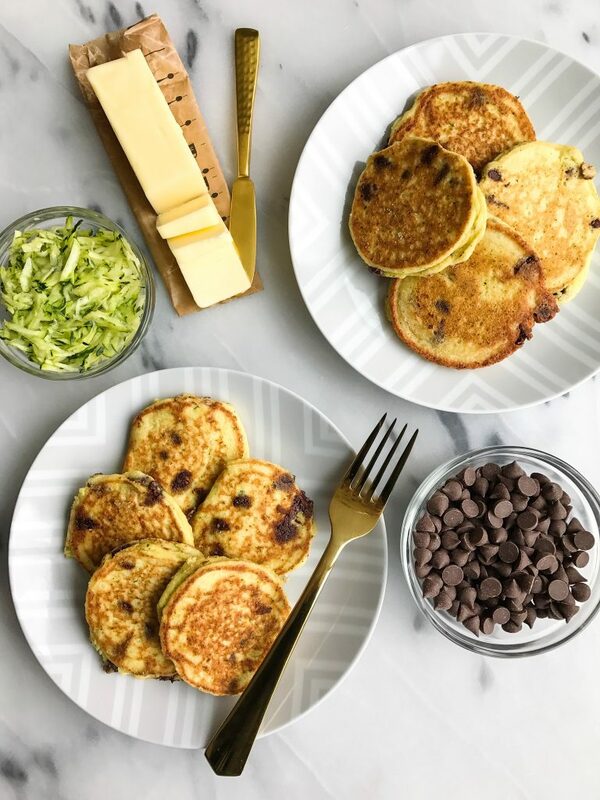 Zucchini bread is one of my absolute favs (or any bread for that matter) and pancakes are a weekend staple over here. 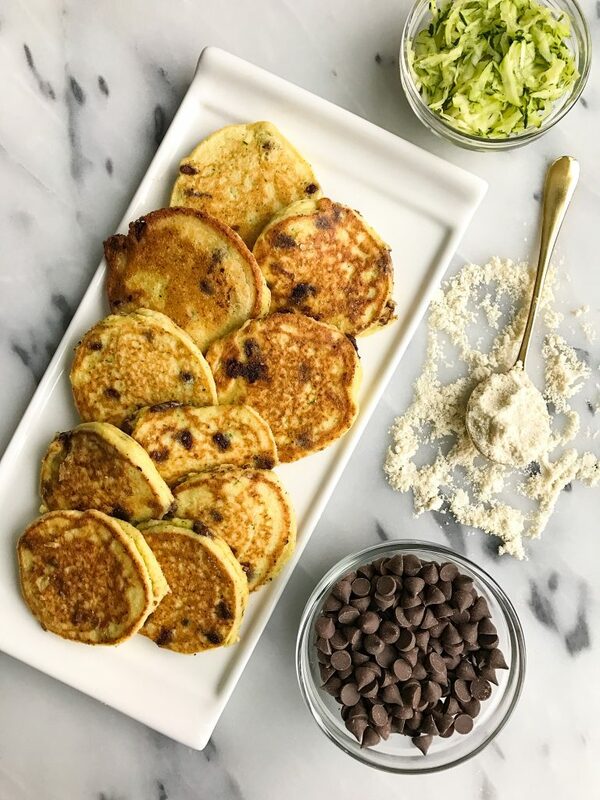 I had never had or heard of zucchini pancakes prior to this and hope they are knew for you babes too. They are super easy to make and even get crispy on the edges. I have not tested any other flours here so I recommend using Bob’s Paleo one! It really is amazing!! 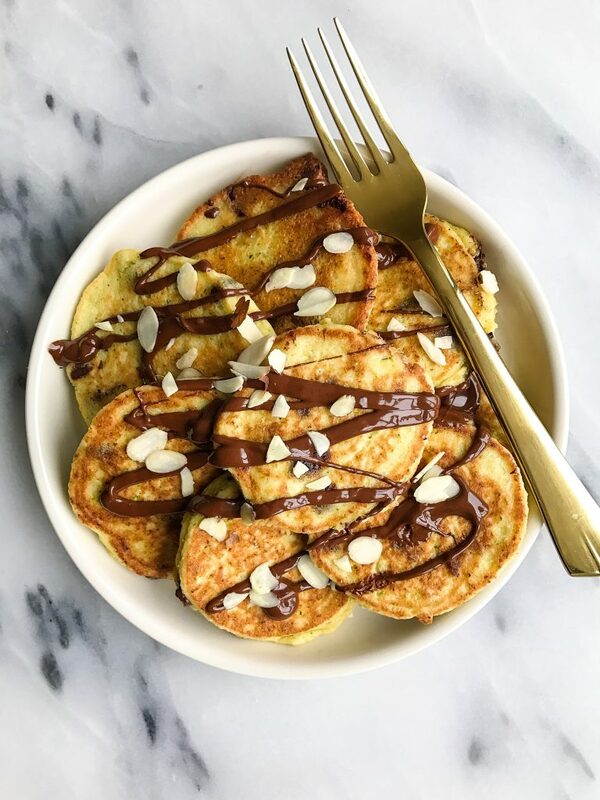 Serve with your favorite maple syrup or nut butter! *Store in fridge for 5-7 days or you can freeze for longer! Thank you Bob’s Red Mill for sponsoring this post. It means so much to me to work with brands that I love and who support rachLmansfield! Have fun at the Expo! I’m driving down tomorrow and will be there tomorrow afternoon and Friday! 100% making pancakes this weekend!!! GOT Me craving them now! Yum.. I’ll have to check out that product – Bob’s Paleo flour. Looks so good and fluffy. It was so fun seeing so many favorite Instagrammers meet you Rachel; your smile shines so brightly in the pictures! And these pancakes sound like little slices of zucchini bread; YUM! Any recommendations for a good substitute for paleo flour (I don’t have any! )… i have whole wheat flour, almond flour, oat flour, etc…Thanks! RACHL! Loved this stack! I just tried it with a flax egg (I halved the recipe) and they were a dream💕💕 just make sure to really get all of that moisture out from the zuchinni!